14.15 a 14.30h Benvinguda a l'EETAC a càrrec del Sr. Luis Alonso Zarate, Director de l'EETAC. Es confima que el contacte el farem només nosaltres, realitzant 20 preguntes a l'Astronauta Nord-americà Mark T. Vande Hei via fonia, sense video. Mark T. Vande Hei was selected by NASA in 2009. From Falls Church, Virginia, Vande Hei earned a Bachelor of Science in Physics from Saint John's University and a Master of Science in Applied Physics from Stanford University. He was commissioned in the U.S. Army through the ROTC program and served as a combat engineer. In 1999, he became an assistant professor of physics at the United States Military Academy in West Point. 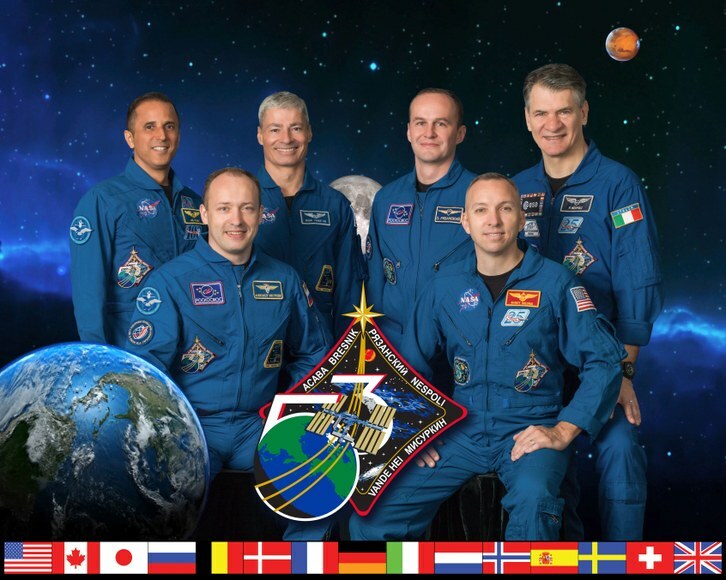 He is currently a part of the Expedition 53/54 crew that launched to the International Space Station in September 2017. Born in 1966 in Virginia. He and his wife, Julie, are the proud parents of two children. He enjoys exercise, camping, windsurfing and reading. His parents, Thomas and Mary Vande Hei, reside in Chanhassen, Minnesota. Julie’s mother, Patricia Murrell, and father, Clyde Murrell, are deceased. Saint Joseph’s High School, Metuchen, New Jersey; Benilde-Saint Margaret’s High School, Saint Louis Park, Minnesota, 1985; Bachelor of Science in Physics, Saint John’s University, Collegeville, Minnesota, 1989; Master of Science in Applied Physics, Stanford University, 1999. Vande Hei was commissioned through ROTC following graduation from Saint John's University in 1989. After graduating from the Army’s Engineer Officer Basic Course and Ranger School, he reported to the 3rd Battalion, 325th Infantry Regiment (Airborne Battalion Combat Team), Caserma Ederle, Italy. His roles there included combat engineer platoon leader, heavy engineer platoon leader, cold-weather-training officer, and support platoon leader. As a combat engineer platoon leader, he served in Iraq during Operation Provide Comfort. In 1994, he reported to the 4th Infantry Division (Mechanized) at Fort Carson, Colorado. While there, Vande Hei served in the staff of the 299th and 4th Engineer Battalions, and then commanded C Company, 4th Engineer Battalion. After completing a Master of Science degree in 1999, he served as an assistant professor in the Department of Physics at the United States Military Academy, West Point, New York. In 2003, he reported to the Army’s 1st Space Battalion at Peterson Air Force Base, Colorado. There, he served as an Army space support team leader, then as the battalion’s operations officer. As an Army space support team leader, Vande Hei deployed to Iraq for 12 months in support of Operation Iraqi Freedom. Other military training Vande Hei completed includes the Army Air Assault Course, Parachutist Course, German Winter Operations Course, Engineer Officer Advanced Course, Battalion Maintenance Officers’ Course, Command and General Staff College and the Space Operations Officer Qualification Course. Vande Hei reported to the Johnson Space Center in July 2006 to serve as a Capsule Communicator (CAPCOM) in the Mission Control Center, Houston. He served as an International Space Station CAPCOM for Expeditions 15 to 20 and STS-122, 123, 124, 126 and 127. Vande Hei was selected in June 2009 as a member of the 20th NASA astronaut class. He completed astronaut candidate training in June 2011, after which he continued to serve as a CAPCOM. From June 2012 to May 2013, he served as the Astronaut Office’s Director of Operations in Russia. He is currently a part of the Expedition 53/54 crew that launched to the International Space Station in September 2017. Legion of Merit; Joint Service Commendation Medal; Joint Meritorious Unit Award; Southwest Asia Service Medal; various other campaign and service awards; NASA Achievement Medal; previous captain of the Saint John’s Ranger Challenge Team. Member of the Veterans of Foreign Wars of the United States, Member of Sigma Pi Sigma, the physics honor society.